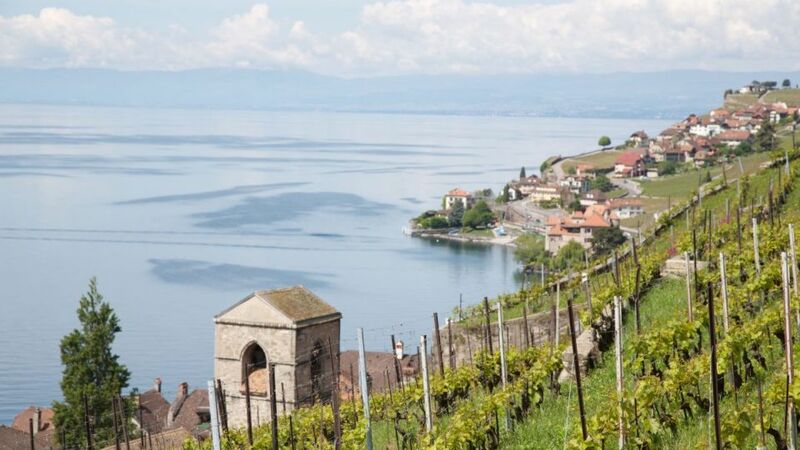 Lavaux might just be Europe's best wine touring region that you've probably never heard of. There are well-trodden wine touring areas in Europe, and then there’s Lavaux. And we might be forgiven for not having even heard of it. Though this bespoke winemaking and touring region has steep terraces first made by monks more than 1000 years ago, virtually all the wine produced here is sold locally, and not exported. This is not France — not the Cote d’Or, Bordeaux or Burgundy. It is not the Rhine Valley or following the Mosel River in Germany. It is not Italy — not Tuscany or Umbria. Lavaux is in Switzerland, settled geographically between them all, with good climate, limestone and clay, and south-facing slopes set above Lake Geneva. The wines of the Lavaux are a secret only to be discovered at the cellar door, and the region’s specialty is quite unusual, too — the chasselas grape variety, used in high-quality wines, is mainly produced by 150 winemakers, many of which are private family domains. Recent research indicates that the chasselas grape is native to Switzerland. Lavaux is in the Riviera-Pays-d’Enhaut district in the canton of Vaud in Switzerland, with Montreux to its east and Lausanne to the west. It is easily reached on Switzerland’s superb rail system from anywhere in the country — even Zurich is only 220km away. This year, the 10,000 terraces, with their 400km of handmade walls celebrate their 10th anniversary of UNESCO World Heritage listing. There is evidence that vines were grown in Roman times but the UNESCO listing says the terraces can definitely be traced back to Benedictine and Cistercian monasteries in the 11th century. From then, the donations of the bishops of Lausanne fuelled the region. They survived the Reformation, thanks to the authorities in Bern understanding their importance, and then the Vaud Revolution in 1798. “It is an outstanding example of a centuries-long interaction between people and their environment, developed to optimise local resources so as to produce a highly valued wine that has always been important to the economy,” UNESCO says. Lavaux stretches nearly 40km, covers more than 800ha, and includes 14 villages. But the key ones for me to tour are St-Saphorin, Vevey, Dezaley and Epesses. And my guide, Pascale Fesquet, says St-Saphorin is the “real spirit of the villages of Lavaux”. It was on the pilgrimage route from France to Italy, and there are records of the faithful from Canterbury in England passing through. In the church of St-Saphorin, a Roman pillar is carved with the date AD47. It marked the way between Italy and northern France, and was incorporated into the church building in 1520. The grapes benefit from a particular set of conditions — particularly “three suns”, as the locals call it. There is the one above, of course, the light reflected up from Lake Geneva, and the heat from the walls of the steep terraces. The lake also helps warm this microclimate, helping the chasselas grapes to ripen properly. Humidity and sun, and all the work is done by hand. The steeper the slope, the better the wine, say locals, and that’s the case in Dezaley, which is on glacial moraine soil, Pascale says. These factors are seen as combining to make a significant difference to the wines’ potential. The vines also benefit from the pure local groundwater but are not irrigated. “Nature organises that,” Pascale says. She adds: “Everyone makes chasselas. Eighty per cent of the winemakers. It’s been planted since the Middle Ages and it’s very traditional.” Fermentation is very important to the chasselas grape. After chasselas comes white pinot, pinot noir and merlot. And then to a small winery which only sells direct — Domaine Joly — with Jacques and Aurelia Joly producing wine in two rooms on the ground floor of their 1672 home, in which there is also a vacation apartment. Jacques is a fourth-generation winemaker, producing about 25,000 bottles a year; though it is a quirk that Lavaux bottles are 700ml. His Villette AOC Les Cornilles has grapefruit and peach tones and is renowned for gaining character quickly. It is also famous for being convivial which is, perhaps, unsurprising given its makers’s surname. His Epesses AOC La Destinee, is also from chasselas but from the heavy clay soil of the Epesses, 1km away. It is generous, aromatic and fruity and noted for its mineral finish. We might not have heard of Lavaux as a winegrowing region, and we might not have thought about it as a walking area, either. But this is where the Swiss and their immaculate public transport systems come into their own. There are yellow signs all over the place, with walking times to the next village. It might be 25 minutes on to Rivaz, or 50 minutes back to Corseaux. And then there will be a train, bus or one of the local post buses to take the walker on or back. It really is one of easiest and convivial forms of wine touring, mainly because it doesn’t even need any planning. You could just set out for the day, with absolute surety that you’d get to your destination, or back home. Or just stop and catch public transport when you’ve had enough. You can get off the train, walk a stretch and get back on another train at another station. There are more than 3000km of signposted trails in the Lake Geneva region. For a break, we dine on local crab and asparagus at Tout un Monde restaurant in the village of Bourg-en-Lavaux. It has a big terrace with a view over Lake Geneva. Asking for “we’re only here once, let’s push the boat out” wine recommendations, the waiter suggests a Dezaley Grand Cuvee at $50. Switzerland Tourism’s website is full of planning and touring information at myswitzerland.com. It has a “Lavaux Vineyard Terraces: The Swiss Wine Route planner”. Stephen Scourfield was a guest of Switzerland Tourism.